When it comes to providing service for our customers, we take a unique approach at Dynamic Repair Solutions. We understand that mobility can be an issue for individuals in wheelchairs, particularly when those very wheelchairs require service or maintenance. For this reason, we provide in-home wheelchair service and repair. If you are confined to a wheelchair or rely on one for long-distance travel, we will come to you to repair or service it. Our goal is to meet your needs with as minimal an impact on your daily life as possible – we believe that coming to you is simply the right thing to do. In order to provide top-quality service on-site, we employ a nationwide network of professional wheelchair technicians. With their help, we are able to assist customers throughout the United States. Possessing a thorough background in the repair and service of mechanical and electrical wheelchair components, our service technicians are skilled and knowledgeable. If your power wheelchair requires service, you can trust that our technicians will get it back in top shape. We understand that in-home wheelchair service and repair means that you will be opening your doors to strangers. Fear not, as every one of our service technicians undergoes a strict and exhaustive background check before he or she is hired onto our team. You can trust that the man or woman who shows up at your door is a professional, who will take great care to respect your privacy and property. Our service technicians have a job to do, and that is their only focus when in your home. Our service technicians are responsible professionals but that doesn't mean they're above having a chat with you! 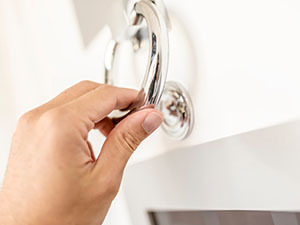 We feel that if someone is going to enter your home to provide a service, at the very least, you should feel comfortable having him or her around. We are confident that you will find our service technicians to be friendly, courteous, respectful, and incredibly helpful. It is all part of our commitment to provide you with superlative service. To schedule an appointment for in-home wheelchair service or repair, please don't hesitate to contact Dynamic Repair Solutions at your earliest convenience. We can be reached by telephone at 888-258-0602 as well as email. We look forward to speaking with you!